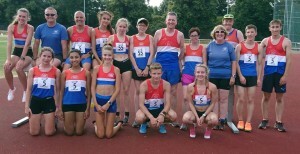 On Saturday 7th July our team of U/17’s, U/20’s and Seniors travelled the short distance to Nuneaton to represent the club in the third fixture of this years Midlands Track and Field League. Going into this fixture we were in a battle with Banbury Harriers for 1st position and both teams were level on 15 Match points whilst we held the slight advantage of points scored, leading by just 6 points! Thank you to everybody that turned out and competed and/or officiated! On the day we were just short of a couple of athletes and officials (with a couple of members competing for the team despite injury) and we finished agonisingly close in 2nd place just 5 points behind Banbury. Congratulations to Tracey Johnson Knowles, Sue Twardochleb, Lizzie Clarkson, Nadine Tomkinson, Martin Bailey, Mark Cotton, Scarlett Cotton, Misha Twardochleb, Elliot Smith, Paul Wakefield, Rachel Wakefield, Julia Bailey, Charles Larsson, Jordan Nixon, Jacob Droogmans, Lucy Matthews, Alex Oakley, Lauren Charlton, Lewis Nagington and Rebecca Twardochleb. If we were to win the final fixture on Sunday 5th August at Kettering and win by more than 1 point then we would be promoted as league champions – Please let team manager Julia Bailey know that you are available and what events you would like to do! Any spaces mean we had nobody competing in that event.